Fashion is never constant and with changing times, the quintessential lehenga choli has been through many transformations with the multitude of accessories available today. The bridal lehenga adds grace and charm to the glowing bride’s look, but the accessories that go with it also speak volumes about her individualistic style. Other than the usual necklaces and earrings, here is a list of other must-have lehenga choli accessories you need to start shopping for. You could go wild with the varied types of maang tikkas. Brides looking for something unique in women accessories are ditching one-tier matha pattis and choosing other options like the double or multi-tier mattha pattis, a jhoomar or passa for the nawabi feel. Even the over-sized maang tikkas (worn by brave brides who can handle all the weight) add a touch of elegance. But what’s grabbing attention of trendy jewellery seekers is the borla, a Rajasthani maang tikka - suavely worn by Aishwarya Rai as seen in the movie Jodha Akbar. Another piece of the latest fashion jewellery is the nawabi-style half matha patti, worn in a side-swept style, which creates a majestic look. One of the easily forgotten pieces of lehenga choli accessories is the bridal bindi. These tiny bindis represent a woman’s strength and energy. The fashion industry has replaced or we’d rather say redefined bindi’s with over-sized maang tikkas. You’ll notice modern brides ditching this accessory just so they do not have to deal with adjusting the placement or fearing it will come off during the function. However, Weddingz recommends you give your bridal look a traditional touch with a bindi. Based on your face cut, you can experiment with the numerous designer bindi styles available. A nathni can completely transform your look and is quick to grabs one’s attention. From small dainty nose pins to large, loosely hanging nathnis, chic brides are going all out to ensure the spotlight is only on them. Make sure it is added in your must-have lehenga choli accessories list. South India’s most popular ornament, a bajuband or an armlet/arm patti is worn on the upper arm. It gives your arms a dressy-look and spruces up your gorgeous mehendi. When going for bajuband shopping, you could easily get confused with the plethora of designs available in the market. Available in gold, silver, diamond and precious gemstone designs, you can find a variety of options to match your jewellery set. Other than the design, there are many options when it comes to fitting. You can opt for a clutch style, a chain style, a thread style, a bangle style or a choker style. Go, explore! Among trendy accessories for women, cocktail rings are a hit! For brides choosing minimalistic jewellery as their bridal look, a statement ring is just the right amount of bling you could add to enhance your overall appearance. Bollywood has spoilt us girls silly. When wearing a bridal lehenga, you’ll definitely find something that is high enough to expose your ankles. Did a close-up foot shot just flash in front of your eye? Well, that’s the whole purpose of having the most beautiful payal or pajeb for those perfect close-up ankle shots prettily captured by photographers. You can shop for such accessories only at Weddingz.in and get exclusive offers. 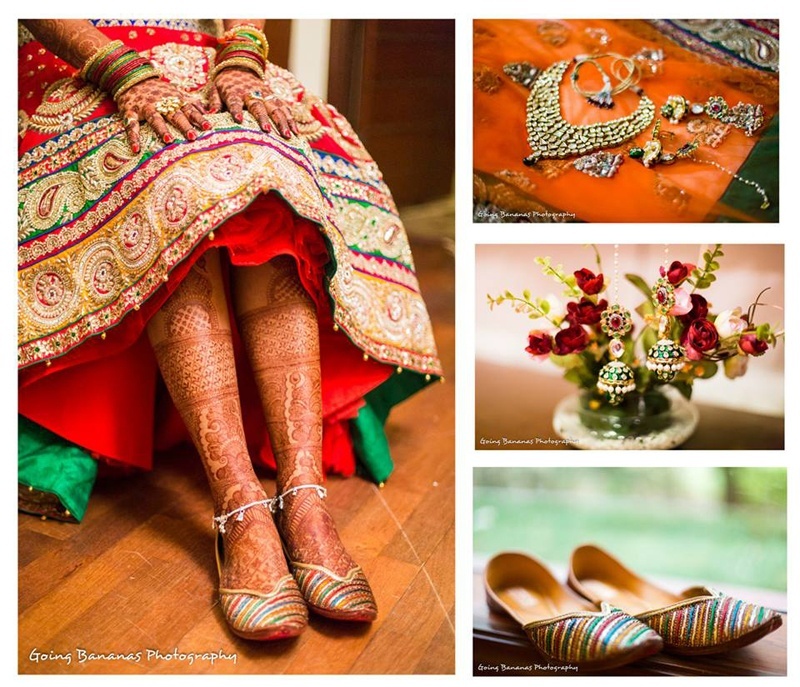 Your selection of footwear is the biggest and smartest decision you could ever make when planning your bridal look. Since many rituals would require you to walk barefoot or stand for long hours, opting for wedges or flats rather than pencil heels is the wisest thing to do. When it comes to footwear, achieving comfort should be your main focus. Hair accessories need to be just right to bring out the elegance in you. The choice of accessories varies depending on the style you opt for. Put on a classic tiara if going for a bun or plaits, the options are endless. You can glam up your plaits with flowers or hair jewellery; they’ll look glamorous either way. The last and most important accessory we guarantee you won’t find in any shop, which actually should’ve been the first thing on our must-have lehenga choli accessories list – but, you’ll agree when we say a surprise element is always worth the last minute. A beautiful smile is the most important accessory for a bride-to-be. It’s your day after all. So, make sure you have the biggest and brightest smile beaming through your bridal attire.